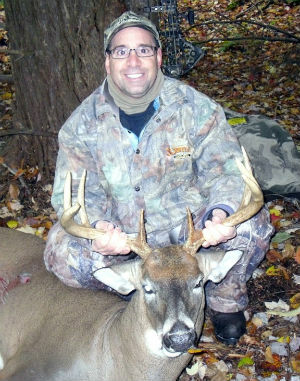 Here it is Saturday; October 26, 2013, with the temperatures finally a little cooler and the rut approaching, I was pretty excited to at last, have a day this bow season where I was able to do my first all day, “dark to dark”, sit of the season. I planned for this all day sit to be in my Creek Ladder Stand, a twenty foot ladder stand situated in a strip of young trees nestled between a creek and a patch of pines. The stand is set about thirty-yards from the creek that pretty much runs east to west through this area and about forty-yards from the patch of pines. The temperatures were forecasted to be in the forties all day, but still pretty breezy out of the southwest with some stronger gusts mixed in. I was hoping for cooler temperatures and less wind, but I’ll take the forties over the upper fifties to low seventies that we’ve been having so far this bow season. None the less, I was excited that my schedule finally allowed for an all-day sit! Over the years, during the rut, I have seen a number of good bucks chasing does and cruising this area checking for does bedded along the creek and in the pines. So, this morning, I was hopeful that some bucks would be moving through the area with the rut creeping up on us and due to the storm front that was supposed to be approaching later in the day. Well, the morning started off quiet and I hadn’t seen anything but a few squirrels so far, but I was out in the woods and still feeling excited and confident! Then, at about 8:25 looking behind me, I caught some movement. At first, it was just a flash of brown in the underbrush about seventy yards behind me. Then, I was able to make it out. It was a coyote ambling my way along the creek. As it got closer, all of a sudden, the coyote spun around, running back from the direction it came from. I watched momentarily wondering what could have spooked it so badly. The coyote hadn’t seen me and it hadn’t reached anywhere near the area my scent could be blowing. What could have spooked it? Then, within moments, I had my answer. All of a sudden the woods in the distance, somewhere in front of me, were alive with grunting sounds and with the running sounds of branches snapping and cracking. Then, there was silence. I scanned the landscape in front of me, straining to catch any glimpse of movement, looking for the buck making the grunts that I heard. With all the commotion, I figured that it had to be a buck chasing a doe or does and my adrenaline was spiked through the roof hoping they would come my way and that the buck would be a mature, shooter buck! I wasn’t seeing anything and wondered if they had already run into the pines or crossed the creek. Then, I heard some grunting, mixed in the wind that sounded like it came from somewhere in front of me again. As I picked apart the woods in front of me, piece by piece, some movement about seventy yards off caught my eye and I could see deer legs moving. Then the deer’s body finally materialized and I saw antlers. It was a buck and he was coming my way. He was grunting and moving slowly in the right direction. As he was getting closer the binoculars confirmed it was a “SHOOTER” through the thick brush, but he had now stopped moving. Then, I saw some more deer legs to my left. It was a smaller buck, a little 3 or 4 point. The next thing I knew the “shooter” buck ran at the smaller buck. Now I could see that the shooter was a mature 8-point buck, not a huge buck, but a shooter buck in my eyes. The smaller buck ran towards me, going by me, less than ten yards from my tree, but the 8-pointer didn't follow. Instead, he ambled back towards the thick brushy area; about thirty five yards in front of me, closer to the pines and started to rub a tree. Then, while watching him, hoping he’d come back my way, I saw another deer coming through the area from the creek. A small 6-point buck was walking towards the pines, heading in the direction of the brushy area and the eight point buck. The 8- point wasn't going to have any of that and ran at the 6-point. The 6-point ran from him running right by my tree. The 8-point buck never presented a shot. Instead, he circled back towards the thick brushy area and started rubbing the tree again while the 6-point walked right behind my tree - less than five yards from my tree. Thankfully the wind direction was right for all this close action. Now the 6-point crossed behind me and was angling towards the thick brush area and pines. The 8-point didn't like him circling towards the thick brush area and started walking towards the 6-pointer grunting. “Perfect!”, I thought, “Right towards my shooting lane.” As the shooter 8-point walked in the direction of the six pointer I drew my bow. He stopped as I heard the six pointer run from behind my stand towards the creek. The 8-point was now standing motionless, less than twenty-yards from me, watching the 6-point fleeing from his advance…but with a tree directly in front of his vitals. I had no clear shot.I stood at full draw for what seemed like an eternity waiting for the 8-point to take that final fatal step forward, but he didn't. Instead, he turned directly away from me and walked in line with that darn tree. I couldn’t believe it…no shot! Again the 8-point ambled through the thick brush towards the tree he had been rubbing before he was interrupted by the 6-point. As I was thinking about blowing on my grunt tube, I heard movement behind me again. Oh yeah, that little 6-point was still there, somewhere between me and the creek and it sounded like he was foolish enough to be heading towards the pines again. Apparently when he had bounded away from the 8-point, he only took a few bounds, just enough to appease the approaching big buck. This time, as the 6-point slowly walked towards the pines, the 8-point had enough. 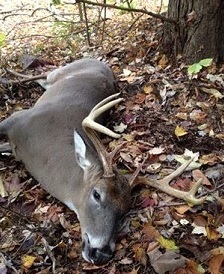 He turned, walking to the 6-point and again headed towards my shooting lane! This time he walked like a deer with a mission towards the 6-pointer, with is ears laid back looking like he was ready to fight. As the 8-point approached, I drew back my bow getting ready for a shot... finally. Again, the lucky 8-point managed to stop behind a tree. Here we go again, me holding at full draw with the buck standing behind a tree, waiting for him to take another step. While holding at full draw, I heard some slow footsteps in the leaves behind me. That intent littler buck was desperately trying to slowly make his way into the pines in spite of that 8-point buck. This time I could hear his footsteps inching closer instead of going away like last time and I knew the 8-point could see that too. That 8-point buck couldn’t take it any longer, he wanted to show that 6-point who was king of the woods and he finally did it. He took the step I needed exposing his chest region from behind the tree. He was now standing about eighteen to twenty yards away and staring at that little 6-point. Somehow through the shaking I settled my pin a few inches behind his shoulder and let the arrow fly....THWACK! God I love that sound of a good hit. The 8-point immediately ran towards the pines and out of sight, but I heard a crashing sound within seconds of him running out of sight. I was hoping the crash sound I heard was of him going down and not just of him running through the pines. I was concerned about the shot because the buck had bolted towards the 6-point seemingly at about the same time I released my arrow. So, I wasn’t sure of the hit or shot placement. I replayed the shot over and over in my mind and thought I heard the sound of a solid hit, but it’s funny how the mind can play tricks on you and now I was doubting the hit or at least the location of a hit. I let my arrow fly at about 8:45 and decided to wait until 10:00 to be sure, since I was concerned about the hit. While waiting, I scoured the ground from my tree stand with binoculars. I couldn’t see any blood or my arrow and my confidence was fading. I battled the urge to get down and check the hit sight, not wanting to push him if in fact the hit wasn’t good and he was bedded just inside the pines. Funny thing, while sitting there two other smaller bucks, a small 6-point that could have been the buck from earlier, and a 4-point came through the area. When I finally got down at 10:00 and went to the spot where the buck was standing at the shot, my heart sank. I confirmed what I saw, or didn’t see, with my binoculars...No blood and no arrow. “Oh boy...I’m not liking this, but at least no arrow, is asign of a hit”, I thought. However, still no blood was troubling. Then, I got on my knees and looked in the direction that I thought I heard the crash in the pines and... Oh Yeah! I saw a white belly just inside the pines As I slowly eased that way, I came across some decent blood. Then, I found my arrow. A pass through, but since he had bolted at the shot, the arrow actually was stuck in the ground sticking straight up and down. I looked at the arrow as I snapped it into my quiver noting how it was covered in blood. Then, I slowly walked up to him, my beautiful 8-point buck. Oh Yeah...a nice mature 8 Point Buck! I love bow season and this time of year!